The ARP roller blind provides protection against sunlight, pleasantly shading the interior during sunny days. A huge range of colours and designs to choose from will enhance the looks of the room and enable the customer to match the material sympathetically with the interior design. The aluminium runners cover the material edges and make it possible to lock the blind in any position. ARP roller blind electrically operated after connecting to the one of Fakro operating devices. In its standard version the roller blind can be operated only when the window is closed. For operating ARP roller blinds installed out of reach the universal ZST control rod is available. 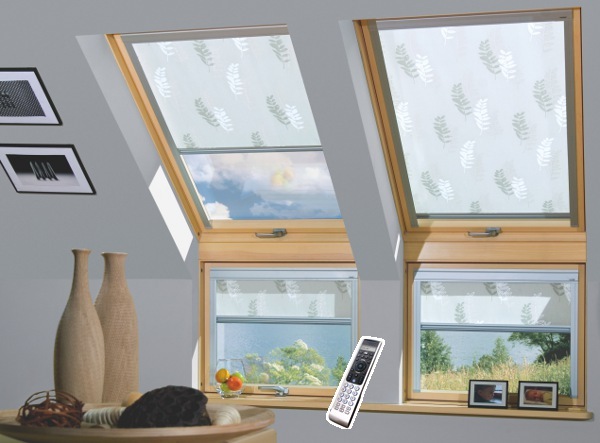 The ARP roller blind fits all types of Fakro roof windows except the FTT window.